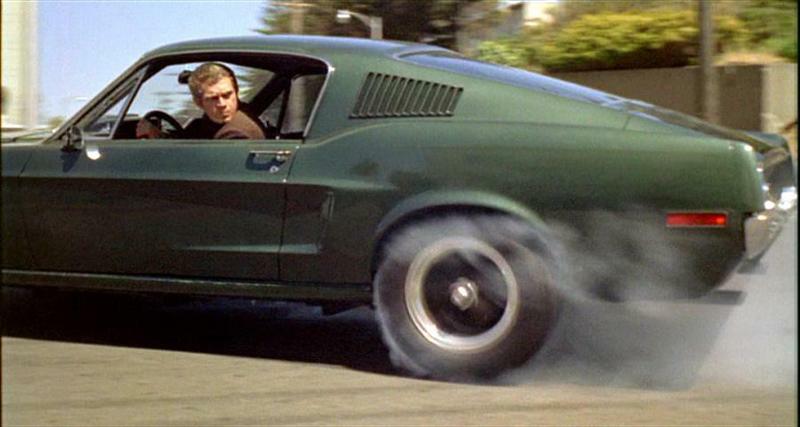 Whether you're a man or a woman, I can sum up the reason to see Bullitt in two words: Steve McQueen. Peter Yates directed Bullitt in 1968 and captured Steve at his height. 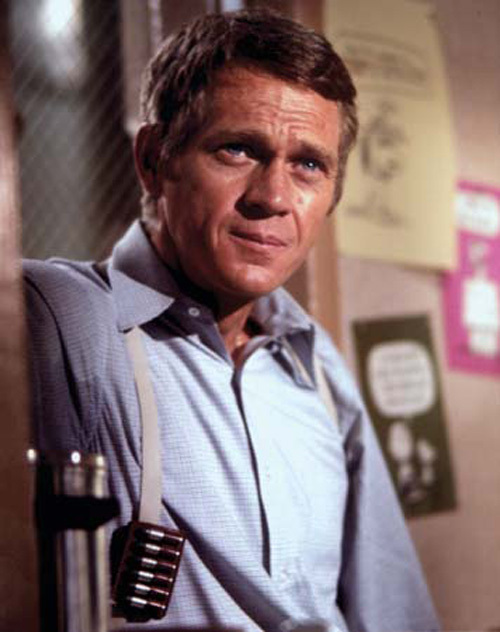 It was written to his strength as a man's man, a tough guy with a rough past who was mostly in movies that showed off his physicality. 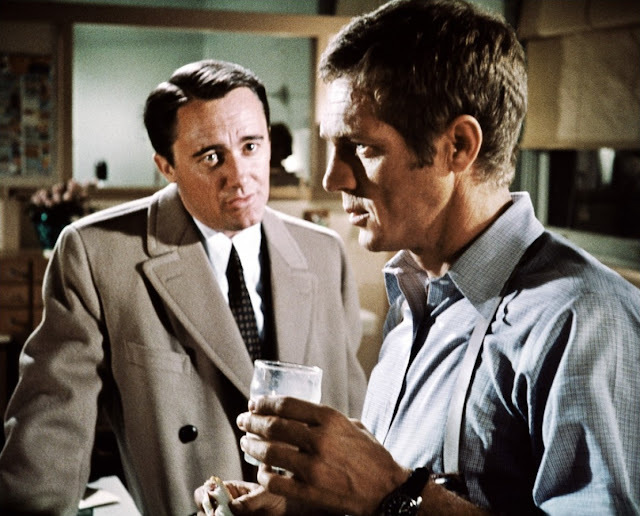 Bullitt is a police drama whose genre meshes comfortably with Steve's acting style--observant, stoic, and without any superfluous dialogue. Then there was Steve's style, which was solidifying in his real life around this time and really came out in this movie. It's interesting to watch him over the years because he was evolving so much as a man. He did have a rough childhood and didn't come from any money. And his early years in film were real rough and tumble, largely westerns if I'm not mistaken. 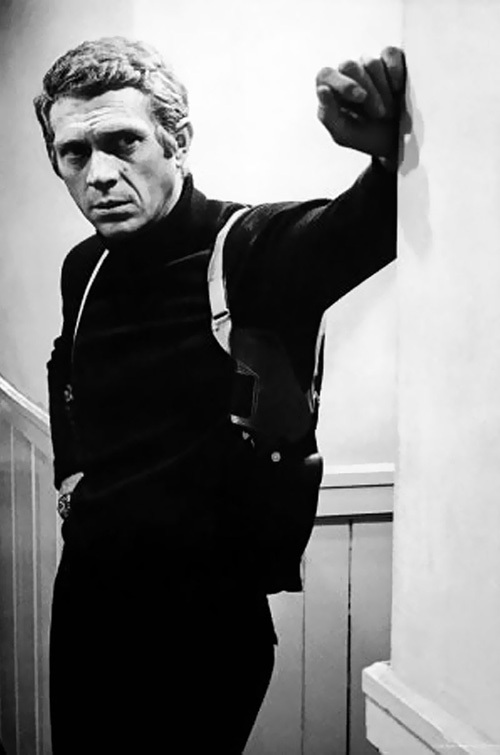 Then came 1968 and Steve was featured in both Bullitt and the original Thomas Crown Affair. Prior to being cast in the latter movie, he had been so rough and tumble that the director, Norman Jewison, almost wouldn't give Steve the part. 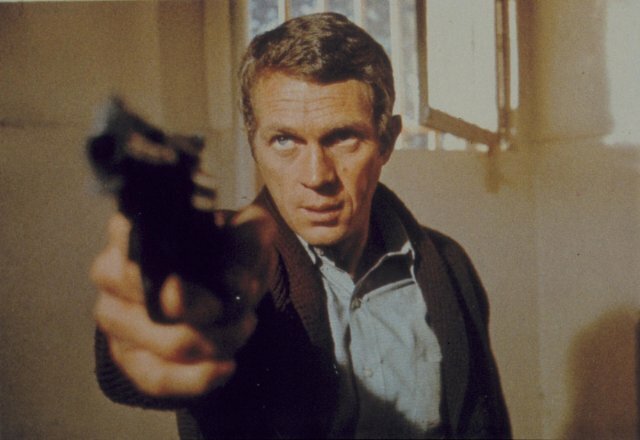 At the time, he just couldn't visualize Steve McQueen playing a debonair millionaire whose wardrobe was largely expensive designer suits. Well, needless to say, Steve got both parts and the opportunity to show how deftly he could pull off just about any masculine style. Whereas Steve adapted to the wardrobe in the Thomas Crown Affair, costume designer Theadora van Runkle made sure Bullitt was adapted to him. 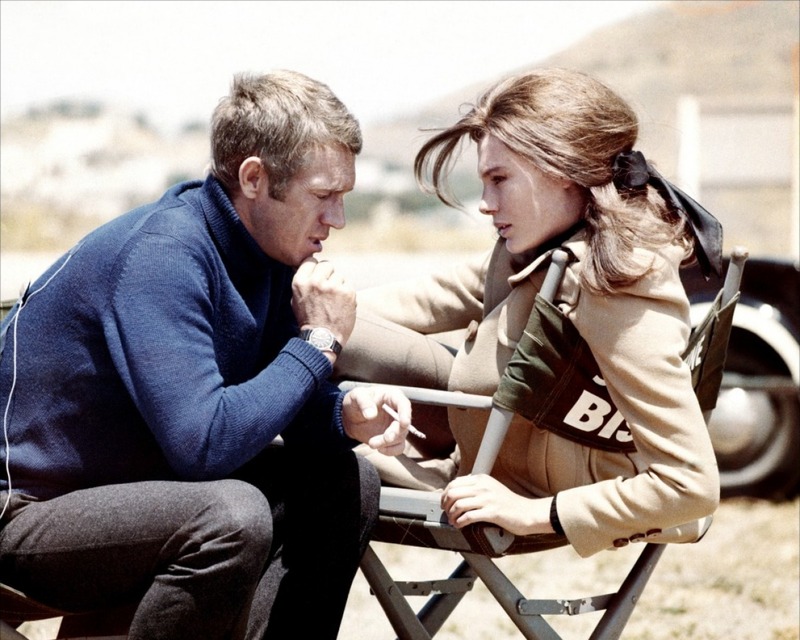 One of the style lessons Steve teaches both men and women in Bullitt is how to do effective layering. 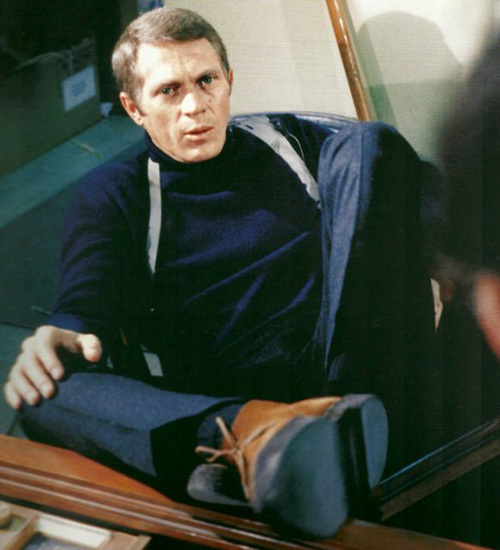 In the movies, layering helps costume designers keep a character interesting even if he essentially stays in that one outfit throughout the film. Robert Redford did this extraordinarily well in Three Days of the Condor. But Steve was really gifted at layering both on and offscreen, showing how to get many looks from an outfit with just a few simple changes. 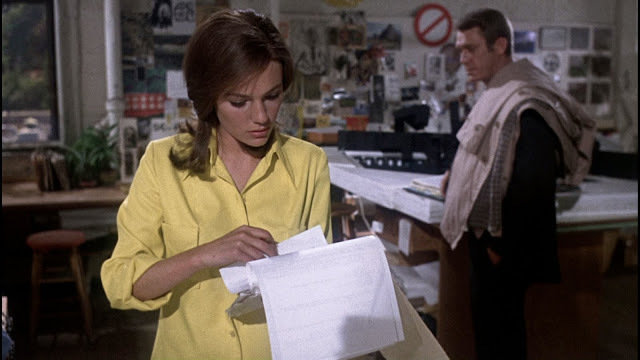 In Bullitt, this meant a trench coat, for starters. Then a tweed sports jacket. And Steve could really pull off a sweater. 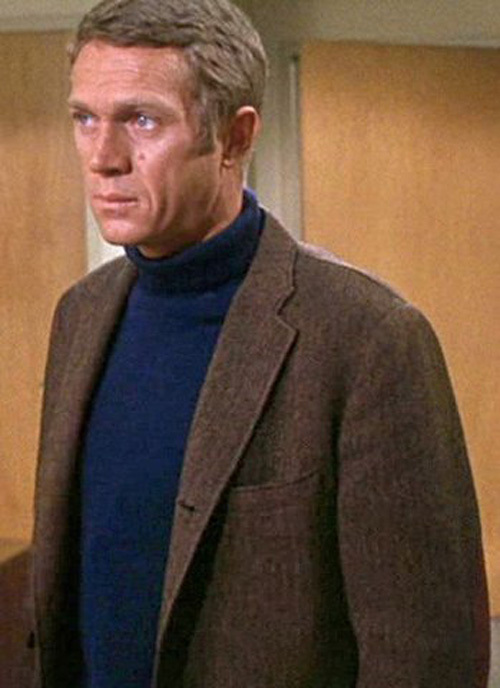 He was big into thick knit turtlenecks, usually in a dark color like navy, and wore one underneath the two coats in this movie. 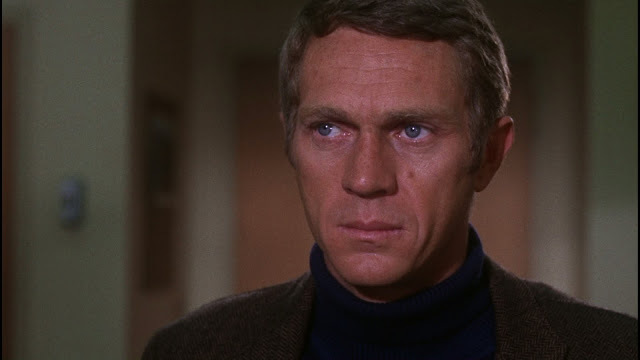 We also see him wearing the turtleneck on its own. 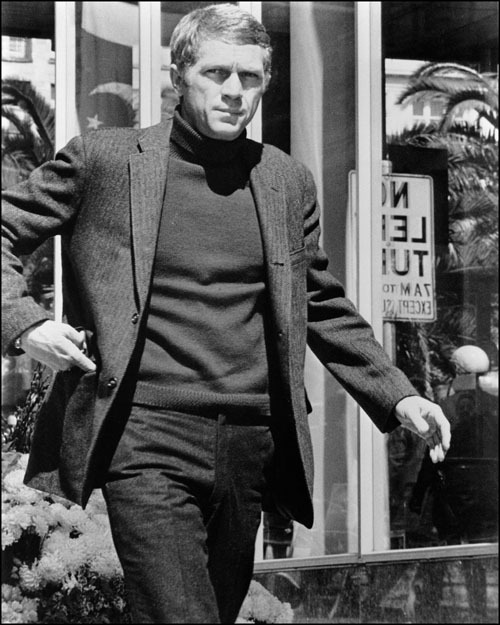 And sweaters often became outer layers as well, such when he layered a chunky cardigan with woven cotton shirting underneath in Bullitt. And that hair? 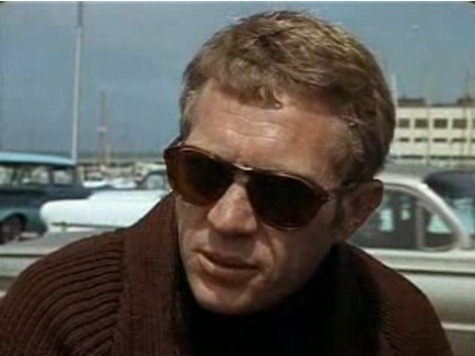 Though he had actually had a few different lengths throughout his career, I think it is his look in Bullitt that is his best style. And that was entirely and completely Steve. He went uncredited on the film as his own hairstylist. Though these looks may seem quite common now--with homages regularly appearing on the fashion runways, especially at Michael Kors (and even Kors himself)--at the time the style was distinctly Steve's. 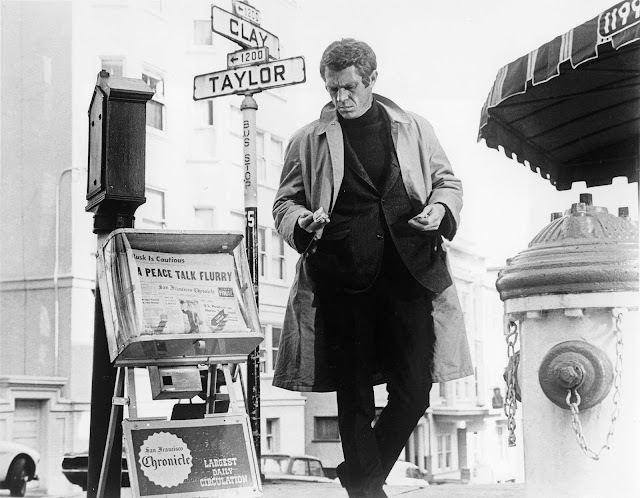 It is his own California casual cool and he still shows how to do it right. Men, take note. Another huge part of the style quotient of this movie? 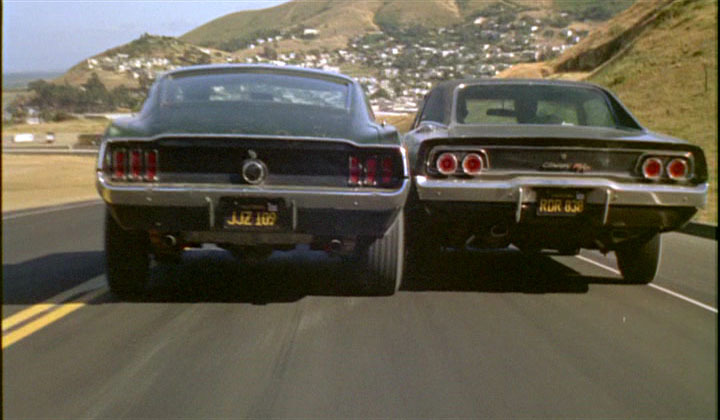 Two more words: the cars. This is yet another aspect of Bullitt that perfectly suited Steve; he was a HUGE fan of motor sports. 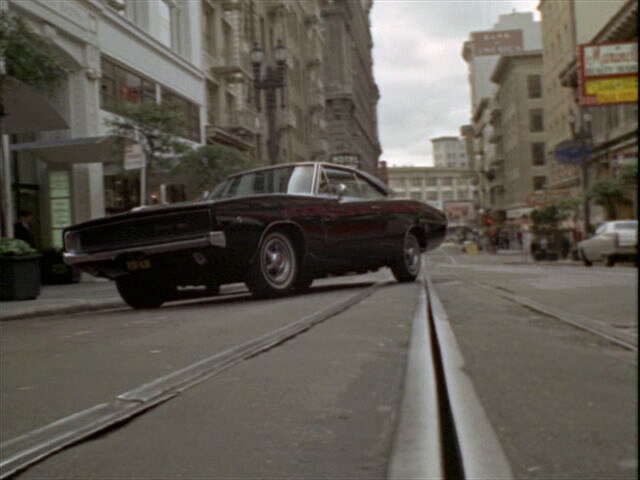 As a result, Bullitt has one of the best known car chase sequences EVER between his green 1968 Ford Mustang GT Fastback and the bad guys' black (of course) 1968 Dodge Charger, which is in the video below. 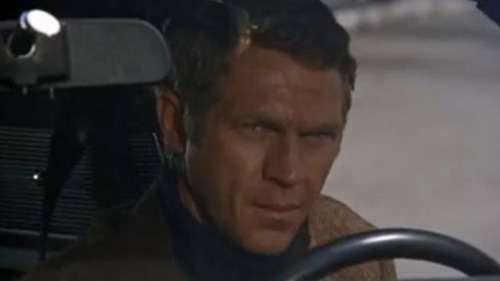 Interestingly, as Steve had spent a good portion of his career in westerns, the car chase was designed with westerns in mind. Just substitute horses for those muscle cars. They do have a significant amount of horsepower, after all. Watch and listen in the video below. Thanks Kay! Steve is such a great example of how easy classic can be. At least he makes it look easy...we all know how much thought goes into looks for anyone with a strong sense of style. And you're right...guys can look at places like J. 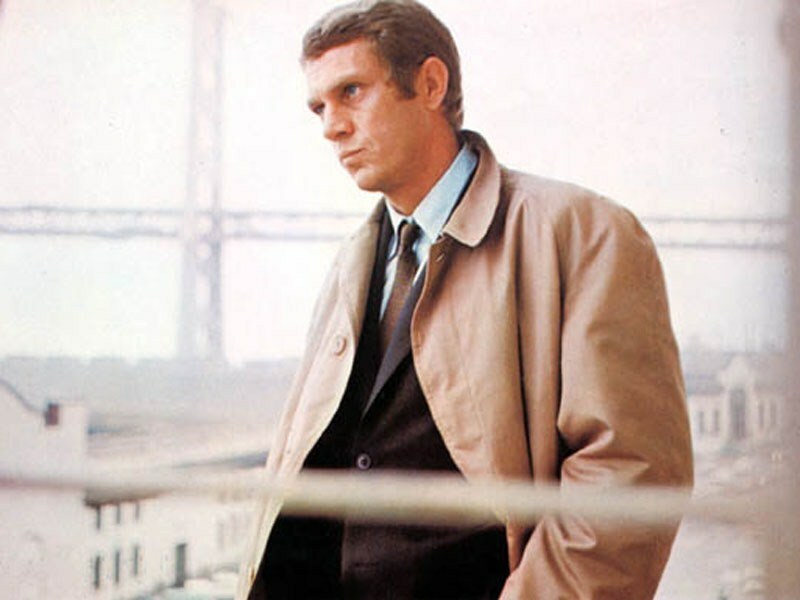 Crew for the key pieces--trench, sports jacket, turtleneck, button down. 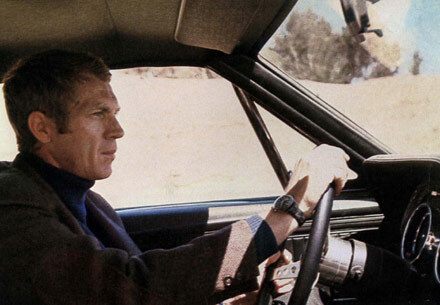 Learn from the master, Mr. McQueen. Great piece Kimberly, now I have to watch this film again and will see it through new lenses with an eye to Steve's stylin' ways! He was so handsome and yet had an approachable look, too. 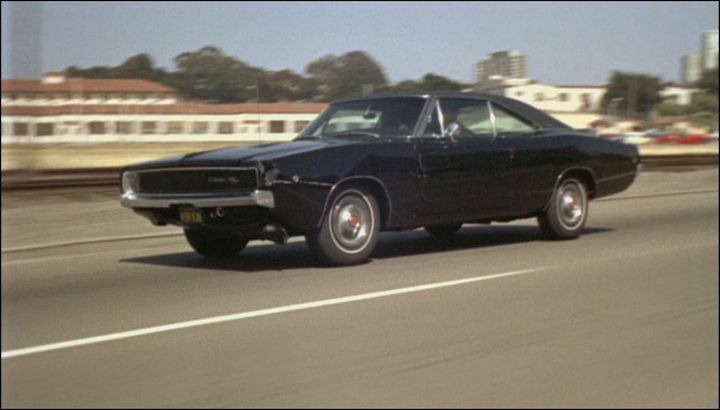 Love your car, you must get a lot of appreciative looks behind the wheel of that ride in LA! Thanks for another wonderful article! Love the pic of you and the car...you both look great. Thanks Linda! I'm happy to cast a light on his style in this movie...makes you enjoy it that much more! And yes, he was sooooo good looking and seemed just like one of the guys. I'm sorry, but Steve's raincoat is NOT a trench coat! A trench coat is double-breasted and belted. That said, I have made the adjustment to the description as you suggest.